Dell Networking Cable, 100GbE QSFP28 to QSFP28, Passive Copper Direct Attach Cable,5 Meter,Customer Kit This Dell Networking Cable, 100GbE QSFP28 to QSFP28, Passive Copper Direct Attach Cable is used to link your fiber networking devices for high-speed, long-distance connectivity. This 5 m cable features an QSFP28 connector at one end and QSFP28 connector at the other end. 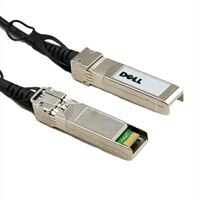 This Dell Networking Cable, 100GbE QSFP28 to QSFP28, Passive Copper Direct Attach Cable is used to link your fiber networking devices for high-speed, long-distance connectivity. This 5 m cable features an QSFP28 connector at one end and QSFP28 connector at the other end.